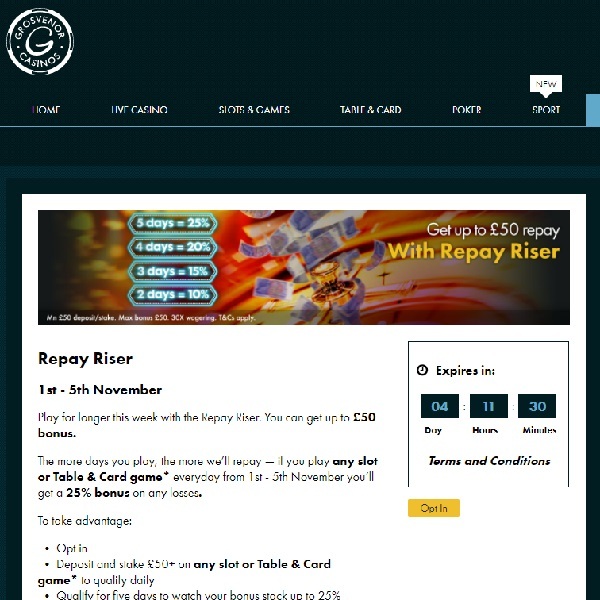 Today and tomorrow are your final chances to take advantage of Grosvenor Casino’s Repay Riser promotion and get a bonus of up to £50. All you have to do is opt in and deposit and bet £50 or more on any slot or card and table game to qualify. You need to qualify both today and tomorrow and then you will receive a repay bonus of 10% up to £50. If you are unable to qualify both days then you can still get a bonus of 5% up to £50. This is a great chance to enjoy all the games on offer at Grosvenor Casino without having to worry about losing all of your money. Regardless of your luck, you can be sure that on Monday you will still have funds available and can keep playing next week.